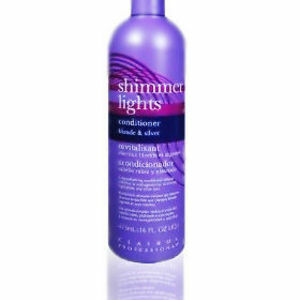 Clairol Shimmer Lights Conditioner is part of a duo of shampoo/conditioner that I use to brighten my gray hair and tone down the not-so-pretty beige spots in front (which developed from my hair being exposed to my cigarette smoke.) After I wash my hair I apply the conditioner thickly around the front (where the discolored areas lie) and more lightly through the rest of my waist-length hair. As I do with the shampoo as well, I wait for several minutes before rinsing. My hairdresser said that gives the purple color in the product time to settle in a bit. 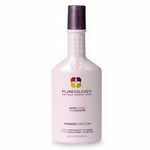 The conditioner works well in helping to brighten the gray and it really does help tone down the unfortunate beige color around my face. It doesn't turn my hair "purple" - the purple color blends with the gray and gives my hair a more even tone throughout. It's also a good moisturizing conditioner for my very dry, curly, and tangly hair. Once dry my hair does look brighter and is less prone to develop "the frizzies". You might want to ask your hairdresser if you should use it every day. I don't know if daily use of a purple conditioner could make the hair temporarily a little too vivid; however I do choose to alternate it with regular conditioners. 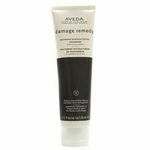 Effectiveness It conditions well and helps keep gray hair looking shiny and bright. It really does help to even out the tone of hair that has a variety of shades in it. Scent The scent isn't easy to identify. 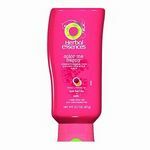 It's not distinctive and the product smells much like many other haircare products. It's a pleasant scent but nothing special. The product only comes in one scent, unlike many of the Clairol brands. it works, but has way too much fragrance. This conditioner, surprisingly, worked on my hair. 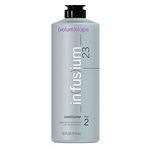 It got all the brassiness out of my hair, and from other reviews, it seems like it works great on grey hair too. But, the conditioner is PACKED with chemicals, and has too much fragrance. The first time I used it, I got some on the bottom of the shower, I tried to wipe it up, but it was permanently stained! No matter what I tried the stain would not come out, I was beginning to wonder why it didn't stain your hair.... and I was thinking of dying other things purple... like tee shirts, then I remembered the smell, the smell was very perfumery, way too much scent, I could barely use it because of the smell. Overall, I recommend this conditioner if you have bleached blonde hair and really hate brassiness, I don't recommend this conditioner if you are sensitive to smells, and be careful when using it to not get it on anything, and if it does get on something, wipe it up immediately, or it will stain! Good luck! Scent WAY too much scent. I love this Clairol shimmer lights conditioner it makes my blonde look more platinum. It cancels out any unwanted yellow brassy tones that I get in my blonde. Its like a toner in a conditioner its not harsh on your hair at all. It conditions my hair keeping it soft and smooth. I love the way it makes my hair look after it makes my blonde look shiny after. The color is like a blue with purple color to it which is a good thing because blue cancels out orange brass and purple cancels out yellow or gold. It always makes the blonde look more neutral. You don't want to use this conditioner everyday maybe every other day or every 3 days. The conditioner will last longer. I bought this conditoner for around 12 bucks and it lasted me 2 months. I always use different conditioners to avoid buildup. It doesn't really smell all that great it reminds me of a baby powder smell. It has tiny pieces of shimmer in it also. Its good for gray or silver hair too.